"The chief executive of Arrowe Park hospital has quit his job with immediate effect for "personal reasons." 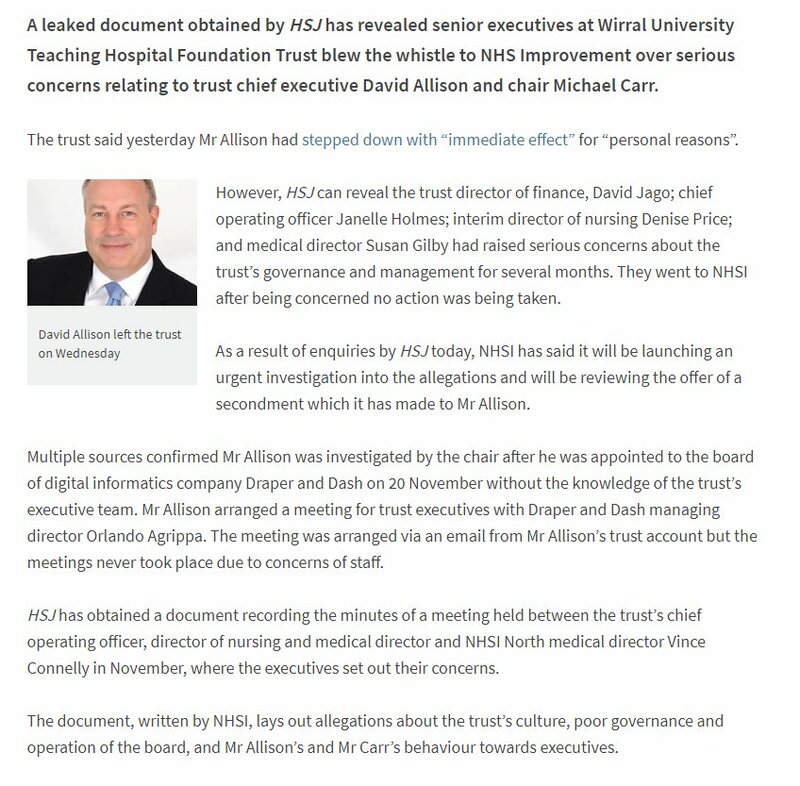 David Allison had been chief executive of the Wirral University Teaching Hospitals NHS Trust since 2012 but said he wanted to move closer to his family in the North East." The Arrowe Park Hospital rumor mill quotes other possible reasons, but I can't say publicly. I have been told that it is only about two weeks ago that the Quality Care Commision inspectors made a announced visit to the Trust. There have been a number of investigations into Wirral NHS services and they seem to peter out to a "these issues seem be being addressed now". I always think APH keeps on throwing good money after bad. It is the centralised site that has had nothing but problems since day one. Clatterbridge had loads of land and room to expand but they've tried their best to virtually shut it down. Didn't the previous one leave under cloud or someone did ? Can't remember the name. Len Richards was his predecessor and was forced out after numerous criticisms internally and externally. 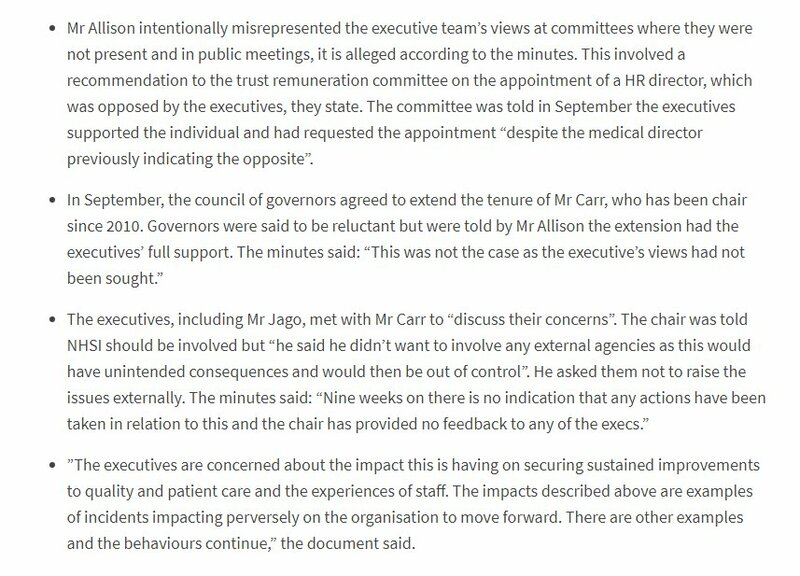 HR Sue Green was suspended then squeezed out. 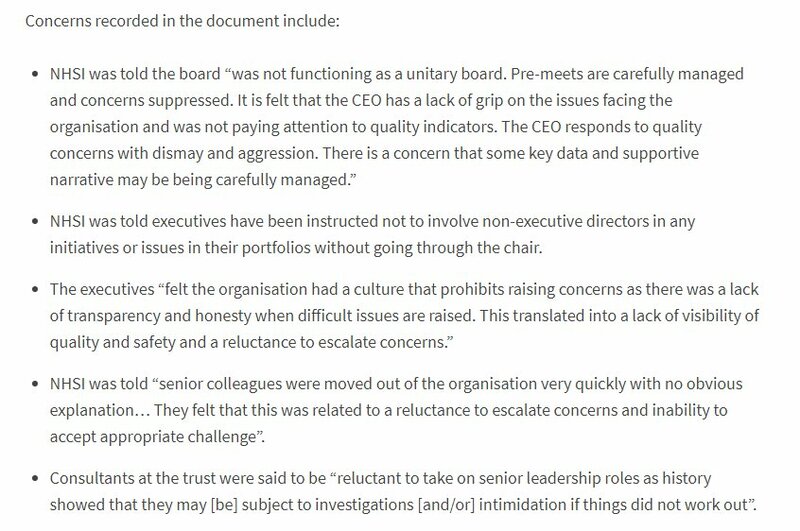 Director of Nursing Michael Monaghan and Maria Jeffery were suspended then sacked for fiddling performance figures. There was another but I've lost that. Sue Green, wasn't she the wife of a Mr Green who was dismissed from WMBC ? She worked there too prior to Arrowe Park. David Green, Director of Technical services who was suspended and investigated but eventually cleared and made redundant. The people who SHOULD be fired are those starving the NHS of cash and privatising it by stealth. The tory government. 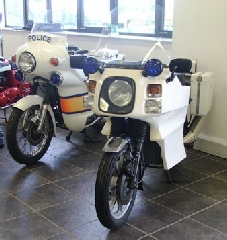 Although a long jail term might be appropriate for dereliction of duty too! A top doctor at a Merseyside hospital who sexually assaulted two nurses was jailed for six years. A&E consultant Dr Ram Manohar, 38, abused the two women while working at Wirral�s Arrowe Park Hospital in 2013. Last edited by fish5133; 20th Dec 2017 6:07pm. Michael Carr the Chairman of Arrowe Park Hospital has resigned. Just over a month ago Dr Palaniappan Saravanan was sacked for sexually harassing junior doctors. The tale goes on as the NHS Improvement probe continues. And the new Chairman is Sir David Henshaw a man that left a great path of dis-union and controversy in Liverpool Council and has been jumping around various jobs ever since. One of his claims to fame was throwing his teddies out the cot when Liverpool Council refused to go along with his personal tax avoidance scheme, unfortunately this led to him extracting a lot more money (above his £180,000 a year income) out the Council with a £240,000 payoff shortly after. So many of these appointments in Council and NHS etc ----of people who muck up the system and then keep moving on to screw up in further strategic positions. Isnt there a word for that -- Apparachiks I think. Maybe hes one of those. It all helps to dismantle the NHS doesnt it . The hoppers aren't all bad, there was a guy that ran Chester for a couple of years, forgotten his name now but he was good. He moved on because he is a fixer and likes fresh challenges. Do you not think that there are jobs for the boys in private industry? in the boardrooms in the workplace, believe me its no different,, If one part of a private enterprise shuts down they will make room in another part for the chosen few, at the cost of other's jobs, like cuckoo's some will get thrown out of the nest under some pretext or another.